In contrast to the Tree of Life of the Biblical or Hebraic tradition and to the Universal Tree of the Sufi one, the Bodhi Tree is a tree of the visible world. It symbolizes for the Buddhist the saving knowledge that releases the being from his illusions. It is a matter of a Ficus bengalensis located in the Indian state of Bihar and carrying small numerous, but non edible figs. It is at the foot of this tree that Siddhartha Gautama knew enlightment and became the Buddha, the Awakened and also the Awakener. In fact, He liked to sit under this tree to teach his disciples the way. Siddhartha Gautama would have stayed seven weeks under this tree, which has since become sacred, in quest of revelation and in prey to his own demons. Before being “Awakened”, he was “waking”. At the first waking, he discovers the worlds as a whole. At the second waking, he contemplated the totality of the being's states. At the third waking, he knew the Bodhi, the Awakening and the Enlightment that lights the cosmic and human world. Then, he discovered the “Four Noble Truths” destined to heal all evils and which became the basis of his teaching. Let us simply recall that they have to do with the nature, the origin, the cessation of suffering and the way to achieve it. 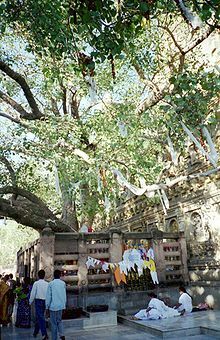 Two centuries after Gautama's death, the tree was surrounded by a temple by the emperor Ashoka, fervent follower of the teaching transmitted by the Master. A rocky throne stands at the place where the Buddha used to sit surrounded by his disciples. The old tree is no longer there, but one of its descendants majestically grew in this place. Other trees punctuated the life of Siddhartha Gautama but never attained the fame of the Tree of the Bodhi. At the time of his birth, his mother held in her hand a branch of Asoka, a tree with strongly sented flowers, in accordance with a rite giving the salutary strengths of the Tree of Life to mother and child. During his childhood already, he knew a first enlightment under a Jambu, a pink apple tree, the tree of the Mount Meru symbolizing the spiritual Centre of the Hindu tradition. It is also said that he meditated for forty days at the foot of a Taranaga called “tree of the passage” as well. It is a matter of the passage where the man dies to a state of being to be reborn into another one. At last, just before dying, Siddhartha Gautama went to lie under twined trees that start to bloom out of season. He truly passed his life in the shadow of flowering trees. In the iconography of the beginnings of Buddhism, the Tree of the Bodhi depicted not only the place of Awakening, but the Buddha himself. The tree became the Awakener and a place of pilgrimage. Nevertheless, the effective presence of the tree has masked the aniconic representation of the World Tree, of the Tree of Life, the roots of which plunge into the pre-Buddhist world.